LOOKING FOR BACHELORETTE PARTY DECORATIONS? 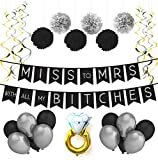 HOW ABOUT BRIDAL SHOWER DECORATIONS? Our Classy and Sassy bachelorette party banners are suitable for both occasions. 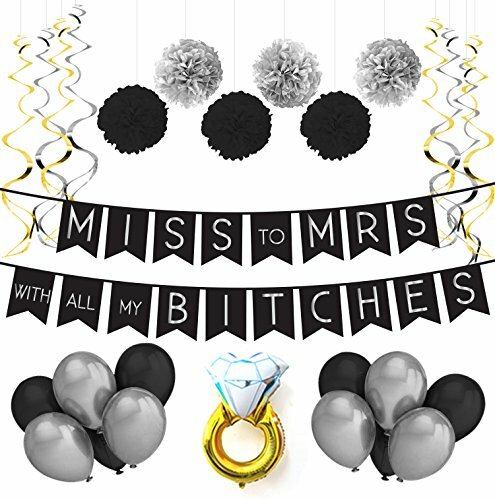 PACK: Pack includes 1 banner, 6 Black & 6 Silver 12" latex balloons, 3 Black & 3 Silver paper tissue poms, 8 silver and gold shiny swirls and 1 Engagment Ring mylar balloon. QUALITY: The beautiful, high quality silver printed letters will catch the attention of your loved ones when they shimmer in the light. Pretty, playful, and hand-strung...These bachelorette party favors are sturdy but not heavy and able to be reused. SIZE - The letters are printed on each 8 x 6 inch black cardstock flags then hand-strung with plenty of extra ribbon for easy hanging. GUARANTEE: We stand by our decoration sets with a 100% money back guarantee. If this bachelorette banner does not make you and your loved one's smile, then your money back.